The Gold’s Gym Club Interactive 890 treadmill is a wonderful starter machine that will save you a ton of money and offer many of the cool features you’ve been hoping for in an affordable machine. The green LED display tracks speed, time, distance, calories burned, fat calories burned and pulse. The 20 personal trainer workouts include 4 Create & Save workouts along with programs for aerobic, weight loss, and performance goals. The handlebars feature handgrip heart rate sensors, as well as controls to adjust speed and incline. * iFit cards are sold separately. UPDATE: The Interactive 890 has been discontinued. 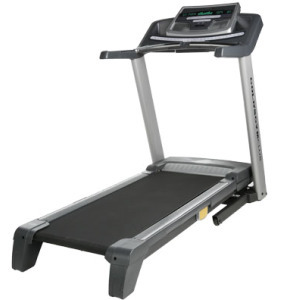 You can take a look at all of the most popular models for sale here to compare specs and prices of current Gold's Gym treadmills. The Gold’s Gym Club Interactive 890 treadmill offers a roomy 20 x 55 walking area, ComfortTrack™ Adjustable Cushioning that lessens the impact on your joints up to 33% as compared to running on the road, a sturdy frame, and a Compatible Music Port for an iPod or any mp3 player so you can listen to music during your workout. You can work out to the installed programs, or buy an iFit workout card to expand the variety of workouts available. Each interactive iFit card is designed by a Certified Personal Trainer and plugs directly into the treadmill’s console. Like any of the pre-programmed workouts, it automatically adjusts the treadmill’s speed and incline, but the iFit programs also offer training tips and instruction as voice of a personal trainer takes you through each workout. Users have expressed their satisfaction for the Gold’s Gym Club Interactive 890 in overwhelming numbers. In 9 out of 10 reviews, it exceeded expectations. The treadmill has a quiet operation, the fan works well, it has convenient cup holders on each side of the console, and users can buy the iFit cards (they are about $20 each and offer tons of programs). But you don’t have to use iFit – there are 20 programs plus a manual mode already installed to give you great workouts. Users recommend you opt to pay for assistance to get it into the house as the 890 model is very heavy. Once inside, two people can set it up in about 2-3 hours. The online list price for the Gold’s Gym Club Interactive 890 is $999 but we’ve seen this treadmill on sale for as low as $799. At that price, it rates as a Great Buy when you consider all the goodies: a power incline, 12 mph speed, in-handle controls and heart rate monitoring, iFit® compatibility, an iPod® music port, and adjustable cushioning. Just 2 or 3 years ago, you would have paid at least $1200 for a treadmill with a power incline! 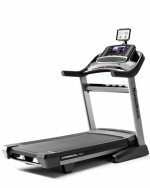 The Gold’s Gym Club Interactive 890 treadmill is a decent machine offering exceptional value if you can snag one on sale for around $800 with free shipping (a $150 value).